Woodland Hills CA was originally named Girard after its founder, Victor Girard Kleinberger. The name was changed in 1945, but Kleinberger’s influence can still be seen in features like the 300 pepper trees that form an arch over part of Canoga Avenue. The community sits in the southwestern end of the San Fernando Valley, with some neighborhoods ascending up into the foothills of the Santa Monica Mountains. Woodland Hills CA is not very densely populated and has a high percentage of educated and relatively affluent residents. After a day out exploring spots like the Upper Las Virgenes Canyon Open Space Preserve or the Top of Topanga Overlook, people may want to stop into a Woodland Hills CA restaurant. If they visit your restaurant, will they find a clean and safe, fire code compliant commercial kitchen? 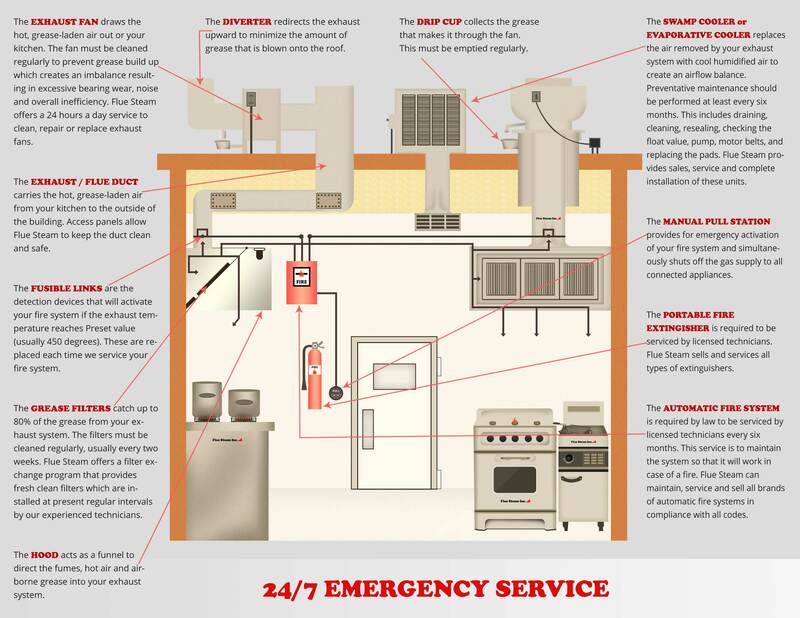 Flue Steam can provide the services you need to keep your kitchen safe, such as exhaust hood cleaning, swamp cooler service, and fire suppression system maintenance.